These charming needlework bags were made for a variety of purposes: carriers for small devotional books and personal Bibles; gifts for friends, patrons or royalty at New Year's; containers for seals; or fresheners filled with sweet powder to lay between garments. Worked on both sides in silk and wool on a sturdy canvas type material and lined in a ribbed silk, this little purse is a fine example of its genre` and is a true survivor. It most certainly was a cherished possession as it shows very little wear and virtually no fading, the colors remaining bright and vibrant. Surrounding the embroidered center is a border meticuliously worked in black silk to simulate lace . . . a charming way to frame the embroidered center pane and I'm sure quite a labor intensive one. A rose colored silk cord with Gold Dore` rings and wonderful Chennile tassles completes the presentation. 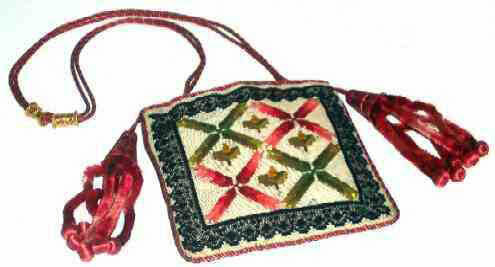 Truly unique and most likely one of a kind, this is a wonderful little reticule, only 5 inches square. It was purchased at Christies and is most likely an English piece that has found its way to our shore.